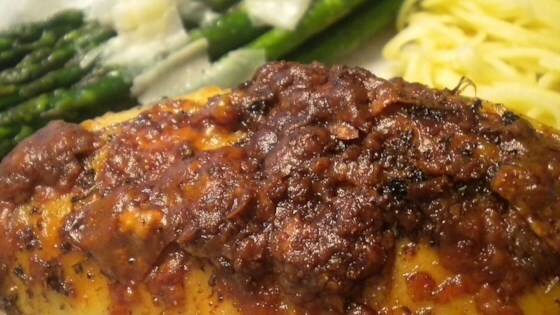 "A whole chicken cut into pieces and baked with a simple mixture of olive oil, chicken stock, garlic, spices and cheese - topped with balsamic vinegar just before serving. The best Chicken Savoy on the planet is served at the Belmont Tavern in Bloomfield, where it was invented by Stretch himself. Go there, order Savoy for two, and order Zita with pot cheese. They make a wonderful combination. The place is not fancy, but the food is outstanding. This is a recipe to eat with your fingers and get juices on your hands. Yum!" Place chicken pieces in a 9x13 inch baking dish. Pour oil and stock over chicken and sprinkle with garlic. Season with oregano, salt and pepper and top with cheese. Bake in the preheated oven for about 45 to 60 minutes, or until chicken is cooked through and no longer pink inside. Pour vinegar over chicken and serve. You can use red wine vinegar in place of the balsamic. This recipe is not bad, however, Balsamic Vinigar is not used....it is made with Red Wine Vinigar that has carmalized while cooking. I know this because my friend is the head chef at Stretch's!